← The Moon’s Nodes, Pluto, Fate and the UK’s Brexit…. This entry was posted in 2013-2016: Most popular post and tagged Astrological sign, Astrology, Astrology and Twins, horoscope, Liz Greene. Bookmark the permalink. Congrats on your three years! It’s been wonderful fun to follow you, and to have my mind stretched, bent, pretzled and soothed. A new question did come to mind with this reading. For years, we’ve talked so much about our “inner child.” Has anyone ever written about an “inner twin”? We speak easily of dual personalties — of Jekyl and Hyde, for example — but that’s not precisely twindom. Have you ever come across the concept? I suppose inner twins would have to be fraternal rather than identical — but perhaps not! You may email me, as long as you are not a spammer. This is true.My wife has an identical twin sister.And observing them you can see the differences and similarities. Thanks for this feedback, Allan. It’s always illuminating to hear from people who have direct experience of twins. My dad was an identical twin. The differences between him and his brother are what I remember most. Congratulations on three years of blogging! Thank you, Anne! I continue to enjoy your posts. The insights are most helpful to my learning process. Thanks, Janet, for this interesting feedback. Have a read of what I replied to Billie regarding the reason I chose those particular twins to write about. 5 minutes can put planets into different houses…change the aspects on planets and even the ascendant and mid heaven…of course twins are slightly different…but one will always lead the other re transits and progressions! Thanks Billie, yes I am aware of this explanation for differences between twins, as I’m sure are most astrologers. What pleased me about the twins featured in this post, was that there was hardly any difference between the two charts: same MC, same Ascendant at almost the same degrees. So very very little difference could be accounted for by the usual astrological variations such as you so rightly describe – which enabled me to demonstrate that twins seem to allocate their different roles before birth. I’m loving your blog. Thanks for doing it! Anne dear! I’ve been intending to read your twin blog ever since you posted it as I have recently started a relationship with a twin. Having recently met his (older) twin brother, it certainly seems true that twins can take very different journeys through life….But an additional comment on how this happens, as one born into a large family. It seems to me that each successive sibling has to find their own particular qualities to develop so as to distinguish themselves from the rest (as the oldest, I had first choice!). So I guess that the same goes for twins, although as you say, there are also the qualities that twins may chose to share. The older brain cells do not allow me to recall the authors, but there have recently been a couple sociological studies of the impact of birth order on siblings, and Prima and Septimus can have much in common with other first- or seventh-borns. Bossy boots springs to mind for oldest, and we are old enough friends for you to agree! Thanks, Jane, for this thoughtful reflection on the ever-fascinating topic of twins. There are number of ways to explore Twins themes: astrological analysis certainly gives some useful perspectives, I feel. 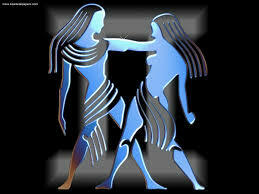 I also have a post on astrological twins – born on the same day, but not related, which you might also find interesting. Check Categories on right-hand sidebar!